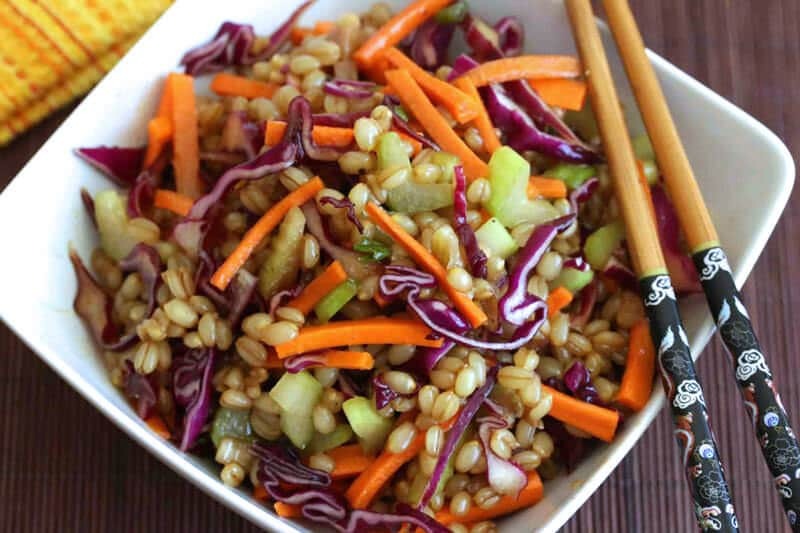 Adding whole grains to a salad is both delicious and nutritious. I use spelt, but if time is scarce there are alternatives which have shorter cooking times, for example, wheat berries, pearl barley, or precooked kamut berries. A winter pesto made of kale, cheddar cheese, and almonds completes the salad. 1. Begin with the pesto: Blend almonds, garlic, and kale or spinach. Add in the cheese and lastly the oil. Add salt and pepper to taste. 2. The salad: Boil the spelt berries, covered, according to the directions on the packaging, for about 40 minutes. Add bouillon or salt toward the end of the cooking time. Drain excess water and let the steam release. 3. Preheat the oven to 425˚F (225˚C). Brush the root vegetables clean, peel the celeriac and rutabaga. Cut into smaller pieces. Peel and cut the onions into wedges. Lay everything out on a baking sheet lined with parchment paper, placing the beets separately. Sprinkle with oil, rosemary, salt, and pepper. 5. 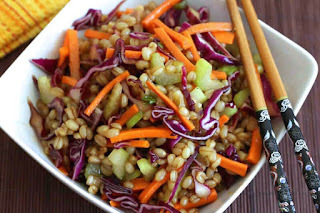 Combine the root vegetables and spelt, and add salt and pepper to taste. Top with grated cheddar cheese and serve with the pesto. A filling salad with a delightful Thai flavor. Originally, the salad was made with beef, but I love lamb and find lamb tenderloin a practical alternative. Sometimes I make an everyday variant with store-bought roast beef. I usually get it sliced extra thin so it feels juicier. Calculate approximately half a pound for four people. 1. The dressing: Divide the chili peppers lengthwise, and coarsely scrape out the seeds, preferably leaving a few in to add a bit of zing to the flavor. Finely chop the chilies and combine together the ingredients for the dressing. 2. The meat: Brown the meat on all sides in oil. Reduce the temperature and continue frying a couple of minutes. The meat should still be pink inside. Add salt and pepper to taste. Wrap the meat in aluminum foil and let rest for about 10 minutes. 3. The salad: Cut the cucumber lengthwise, scrape out the seeds, and cut into thin slices. Peel and cut the papaya into cubes. Arrange the lettuce leaves, cucumber, papaya, and herbs onto plates. 4. Slice the meat into thin slices and distribute atop the salad. Drizzle with dressing and garnish with leeks and nuts.